Sunday 2/10/19: Singer Landon Paddock kicks off our Nat King Cole centennial tribute! Please join us this Sunday as vocalist and jam regular Landon Paddock leads the jam for kicking off our male vocalist series in February in honor of Nat King Cole’s 100th birthday. You can see Landon crooning around town, including at JoJos, Columbia Station, and other joints. Come sit in with Landon and the rest of our terrific Second Sunday house band. No cover! 6:30-9:30pm upstairs @ The Brixton (901 U Street NW). Sunday 1/20/19: Saxophonist Jeff Antoniuk returns to the jam! This Sunday, saxophonist and jazz educator Jeff Antoniuk returns once again to host the jam session as our special guest! Among other notable performances and endeavors, Jeff is the long-time organizer of jazz workshops and master classes in the greater DC area. Please come join Jeff and the rest of our terrific Third Sunday house band. 6:30-9:30pm upstairs @ The Brixton (901 U Street NW). No cover! CANCELED (snow): Sunday 1/13/2019: Vibraphonist Chris Barrick returns to the jam! Please come out to this Sunday’s jam session as outstanding vibraphonist Chris Barrick returns as our Monthly Master jazz artist! Come sit in with Chris and our outstanding Second Sunday house band. All musicians and appreciators welcome. 6:30pm-9:30pm @ The Brixton (901 U Street NW). No cover! Sunday 1/6/19: Victor Provost kicks off 2019 on steel pan! Please join us this Sunday as long-time friend of the jam Victor Provost kicks off 2019 by returning as our guest artist on steel pan! Victor has been named “Artist of the Year” by the CityPaper in their annual “jazzies” and is perennially named “Best Jazz Percussionist.” Come join Victor and the rest of our terrific First Sunday house band. No cover! All musicians and appreciators welcome. 6:30pm-9:30pm @ The Brixton (901 U Street NW). Please join our list by clicking here. 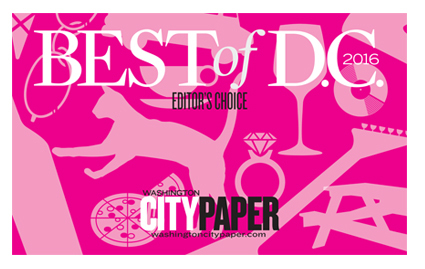 DC Jazz Jam is proud to have won "Best Jazz Jam Session" in the Washington CityPaper's 2013 and 2016 Readers' Poll (the two years they have included the category)!